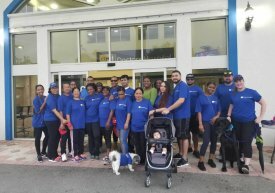 On Sunday June 10th 2018, CTMH Doctors Hospital proudly presented their first 10K ‘Health is Wealth’ Walkathon in promotion of healthy living and a healthier lifestyle for the people of the Cayman Islands. 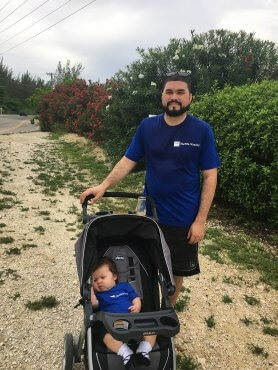 This annual event took its first steps with approximately forty people, two dogs, and the newest addition to the CTMH DH family – Isabel Tomlinson at four months old. The day was filled with beautiful sunlight as they began their journey from 16 Middle Road. This event was generated in hopes for the community and their families to get to know our colleagues. With each step, our staff makes the effort to reveal healthier lifestyle choices for the people of the Cayman Islands. The staff embarked on this walkathon with great determination to highlight the exceptional stepping stones that it takes to be healthy and proud. After 3 long hours of strutting to 7 Mile Beach, the 10K Walkathon came to a close with everyone relaxing on our world-class sunny sands and turquoise waters, together. Nadine Tomlinson-Brown stated, “We at CTMH Doctors Hospital are working together today for better healthcare tomorrow.” This proactive event is to help raise awareness to all Cayman communities that CTMH Doctors Hospital has the professionally qualified team that can customize personal one on one healthcare services. Don’t waste any more time, get out there and create the health outcomes you desire today!